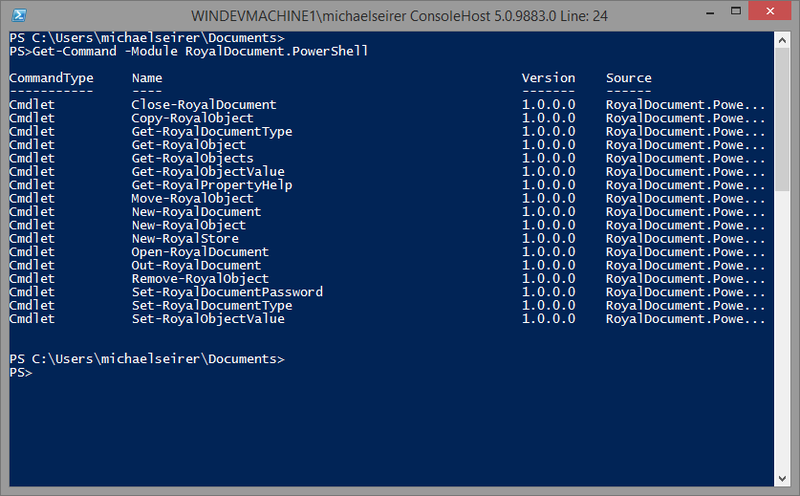 The PowerShell module is located in the same directory as the Royal TS binary (RoyalTS.exe) and named RoyalDocument.Powershell.dll. Import this DLL as usually by using the Import-Module commandlet. Note: This copies the RoyalDocument.Powershell.dll to the first path that is specified in the $env:PSModulePath variable. 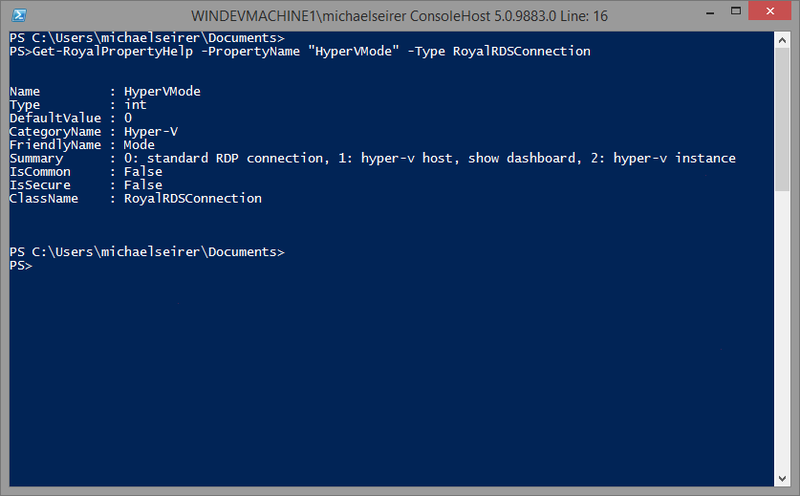 Additionally extended help is also provided in the Royal TS Help file named RoyalTS4.chm that is located in the installation directory of Royal TS. 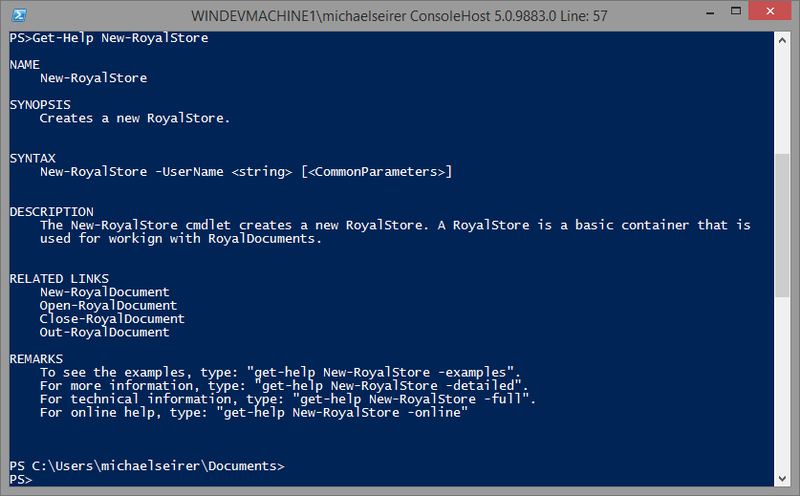 Before you can work with documents, you need to create a RoyalStore. This holds references to 1 or more RoyalDocuments. After creating a new RoyalDocument by using the New-RoyalDocument you can use the Out-RoyalDocument to actually save it disc. $folder = New-RoyalObject -Type RoyalFolder -Folder $royalDocument -Name "DMZ" -Description "dmz zone"
$rds = New-RoyalObject -Type RoyalRDSConnection -Folder $folder -Name Demo-Server1 -Description "used for demos"
Now you can see in the opened document that we have indeed created a new RoyalDocument with one Folder and one Remote Desktop Connection inside. 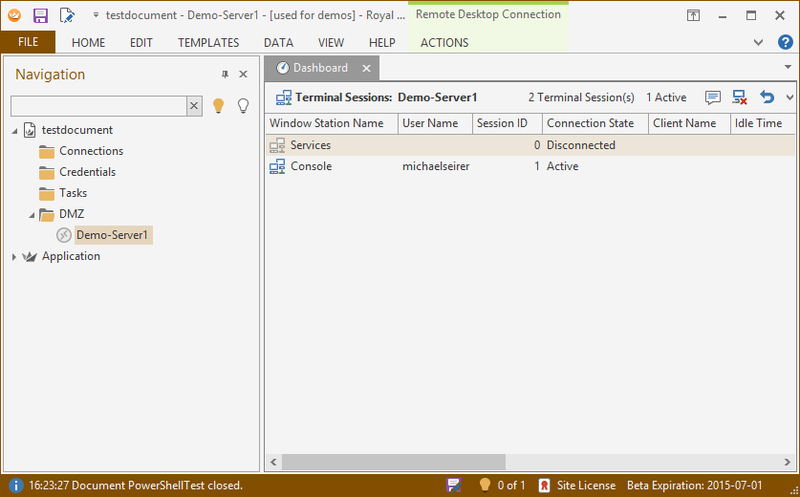 Set-RoyalObjectValue -Object $rds -Property "CustomField1" -Value "http://192.168.1.105/login.htm"